Reims Cathedral, jamb figures of saints, 13th century, High Gothic sculpture, France. 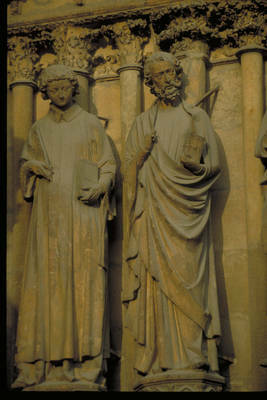 Reims Cathedral, jamb figures of saints, 13th century, High Gothic sculpture, France.ote the palm leaf held by figure on the left. Reims was the coronation church of the French monarchy.